Hey, help a guy out, will ya!? From the little store below you can now purchase any of the songs I have posted so far for a mere $0.99 or buy the month for $2.99 OMG! So cheap!? Yep. Sign up is a snap, too. So don't be afraid of it!!! Uh oh. 13 is supposed to be unlucky, isn't it? Never understood quite why that is, but as my luck is u sually subpar 13 can't possibly rattle me. Well, Happy (belated) Turkey. I hope you all drifted off into a sweet Tryptophan induced slumber like I did. I suppose it could have been the wine, too. In honor of the Thanksgiving Holiday I got a U-turn ticket and it's $150 bucks! I put up a little album of four songs for only 2 BUCKS to help pay this beast. That's 4 songs for 2 bucks, what a bargain! This song is about a girl who just can't ever seem to act right. really-really-poor' fund. Oh...you hadn't heard of that one 'eh? Well...now you have. 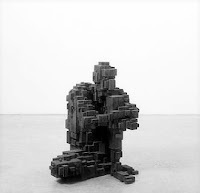 Then I thought about the bricks as a metaphor for years, and the more you lay them down the more you are diminishing; like our little brick man, see. Then this song came out. God, I need to get out of the house more. Serious bouts of melancholy this week gave rise to this song about giving up. This song was one of those mysterious events that just kind of come thru you, because before I knew it--it was finished. Nice when that happens, isn't it? I started out intending to make it a slow morose hide-in-your-bedroom type Brian Wilson thing, but it just didn't want to go that way, and I'm happy with it. A bit of cool news, too--the .blogspot. was dropped from the address--so now it's just www.onesongperweek.com Much better! And AND! I got a great write up by the folks at Puddlegum so go and check it out, and add them to your blogroll and to your list of people to tell other people about! Hey, buy something, will ya!? From the little store below you can now purchase any of the songs I have posted so far for a mere $0.99 or buy the month for $2.99 OMG! So cheap!? Yep. Sign up is a snap, too. So don't be afraid of it!! !